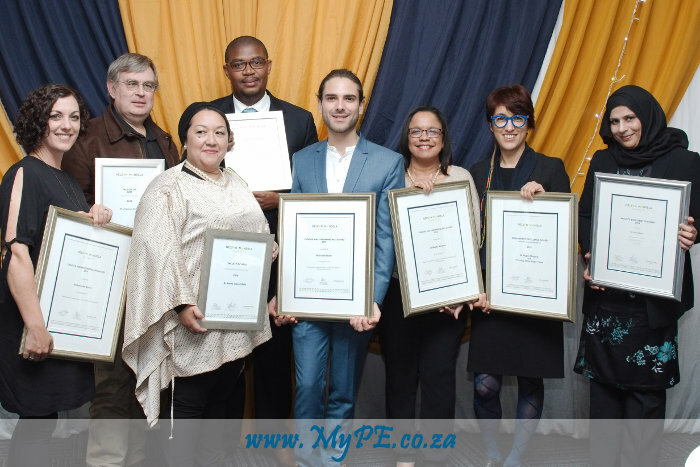 Nelson Mandela University staff who received awards in the Creative category at the annual Research, Teaching and Engagement Awards, which took place on Thursday evening. Nelson Mandela University recently recognised the institution’s academics who have excelled in their respective fields of teaching, research and engagement – with these efforts aimed at making a difference in communities and effectively changing the world. The University’s annual Research, Teaching and Engagement awards – held at the St George’s Cricket Stadium on Thursday night – saw numerous Mandela University academics lauded in a variety of categories, from merging teachers and researchers to engagement and innovation excellence, in recognition of their work. Zoology professor Pierre Pistorius, whose research focuses largely on marine top predators, walked away with the coveted Researcher of the Year award. Computing Science professor Andre Calitz and Law of the Seas SARChI Chair Prof Patrick Vrancken scooped the University’s Research Excellence award, while Business Management lecturer Ms Shelley Saunders – whose use of visual and audio material in her teaching helps students excel – received the Excellent Teacher of the Year award. SARChI Chair in Microfluidic Bio/Chemical Processing, Prof Paul Watts, was recognised with an Innovation Excellence award, while the uYilo e-Mobility Project team – comprising Messrs Hiten Parmar and Xander Theron, and Dr Nico Rust – received the Innovation Excellence Project Award. Zoology professor and Director of the Centre for African Conservation Ecology, Prof Graham Kerley – who spearheaded a national collaborative assessment on predation – received the Engagement Excellence award in the science, technology, engineering and mathematics (STEM) field. Dr Magda Minguzzi, who directed a team for the international collective art performance The Way of the Water, walked away with the Engagement Excellence award in the field of Social Science and Humanities as well as an award in the Creative category. University Arts, Culture and Heritage head Mr Michael Barry and his team, which includes Ms Nicki-Ann Rayepen, received the Engagement Excellence Team award, in recognition of the stage production I Mpilo Y Amanzi, which was based on the aforementioned The Way of the Water. Dr Jennifer Jansen, who leads the University’s on-campus Missionvale Community Psychology Centre (MPC), was also awarded the Engagement Excellence Team award for the work done through the centre. These were just some of the award recipients. Speaking at the awards function, Vice-Chancellor Prof Sibongile Muthwa congratulated the award recipients for their “unstinting and excellent work in growing the young minds of our students in class and in propelling their intellectual development in ways that go far and beyond the classroom”. “This evening offers us an opportunity to celebrate our achievements in the past year, which are captured in the Research and Innovation Report,” she said. “The research report provides us with a platform to document and recognise the research achievements of the institution. Prof Muthwa said in recognising these achievements, there was a need to also identify areas in need of improvement. “For example, the throughput of our postgraduate students, both in terms of completion times and in terms of progressing from one level of postgraduate study to the next, requires improvement,” she said. “Similarly, the overall area of research outputs requires focused attention and particularly stimulation of research activity so that those colleagues who are engaged in research and innovation endeavours become the majority, rather than the minority as is currently the case. “We must also find creative ways to diversify the pool of research-active academics, both in terms of demographics, but equally importantly in terms of areas of inquiry. Mandela University has identified six institutional research themes – which collectively speak to both the present and the future – in a bid to solidify efforts of positioning the institution in terms of research priorities in the higher education sector. These themes are Oceans and Coastal Sciences; Social Justice and Democracy; Environmental Stewardship and Sustainable Livelihoods; Innovation and the Digital Economy; Origins, Culture, Heritage and Memory; and Humanising Pedagogies. “These themes are carefully crafted to be a fine balance between current areas of proven and sustained research excellence across faculties, and new areas that the University wishes to nurture and develop,” said Prof Muthwa. Norwegian ambassador, Her Excellency Astrid Helle, who delivered the keynote address, spoke of the longstanding relationship between her country and South Africa, as well as a direct one with the University, particularly through the ocean sciences research. “Norway and South Africa have good bilateral relations and our countries cooperate on many different levels … science and research is one of the areas where we work together, and where there are great possibilities for expanding our collaboration,” she said. Ambassador Helle said her country has a strategy for cooperation on higher education and research with selected countries, including South Africa. “The strategy, called Panorama, seeks to further develop current research cooperation in areas of strategic interest to Norwegian research groups and institutions, with particular focus on certain thematic areas such as marine and other aquatic research, the maritime sector, climate and the environment, medicine and health, biotechnology, polar and space research, peace and conflict research, and development research,” she said. Carpe Diem Team: Anne-Mart Olsen, Dr Florence Southway Ajulu, Dr Thoko Batyi, Ms Eunice Champion, Me Linda Mostert and Ms Ronelle Plaatjes.